We can see the Herodion and Bethlehem from the roof of our office at Tantur. We can see the Herodion, Bethlehem and the city walls of Jerusalem from the terrace of our apartment and from the roof of our staff apartment. When we gaze upon these sites, we often ponder what important role they played in molding the images we have of Biblical and ancient history. For twenty five years, we have cheered on Prof. Netzer in the search to find that tomb which has eluded archaeologists and historians for so many decades. We hoped with him that the tomb was intentionally hidden so that if it was found in our lifetime, the contents would have been found intact. We hoped that this tomb would have been found filled with priceless treasures reflecting the opulent lifestyle of the only Jewish ruler who was fully recognized as sovereign by Rome. He created the monumental platform and sacred precinct that we still recognize as “the Herodian Temple,” of which it is stated “he who has not seen the temple has not seen a beautiful building.” He created the then state-of-the-art port of Caesarea Maritima, which was the second or third largest port in the Mediterranean. He created the temple of Augustus at Samaria, which was said to have been able to be seen glistening in the sun from boats on the Mediterranean Sea. He also created Masada, a virtually impregnable desert fortress which fell only to an entire legion of Roman soldiers. 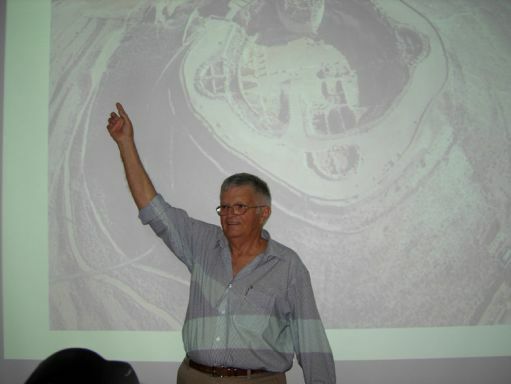 Prof. Netzer points to the place of the tomb. If you were favored by Herod you were well endowed for life. However, there was another side to Herod the Great. Perhaps he should have been known as “Herod the Terrible”. If you crossed him there was no safe place to hide, for you or your family. In fact, there was no safe place to hide for his own family. Augustus Caesar was quoted to have said, “It is better to be Herod’s pig than Herod’s son.” Herod was both hated and feared by his subjects. It should not be so surprising therefore, that Herod’s final resting place was looted, vandalized and broken into small pieces. The massive funerary monument or mausoleum that he had built for himself was entirely dismantled, leaving behind only its sizable 10×10 meter base. For anyone in antiquity to do such a thorough job of destroying the last remains of Herod (and possibly his sons), they must have hated the former king with a vengeance. 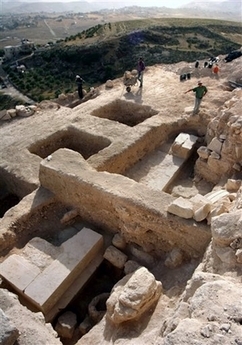 We would like to congratulate Prof. Ehud Netzer on the fulfillment of his life-long dream to find King Herod’s tomb. We would also like to encourage him to continue to find more fragments which might tell more of the story of this king and his royal line.